And to think, we were starting to get worried about Atlas. 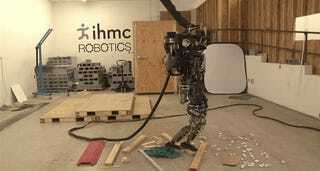 The humanoid robot, which in some situations has looked terrifying, in others looks...less so. In this test, designed to see if Atlas can overcome a few sticks lying on the ground, Atlas proves that it can not overcome a few lying on the ground. Sleep easy, folks. The robot apocalypse is a ways off yet.